After a brutally cold and snowy winter, it appears Chicagoans are ready to kick off the spring running season. Registration for the 35th annual Shamrock Shuffle, dubbed the world’s largest 8-kilometer road race, closed Thursday after the 40,000-participant cap was reached. 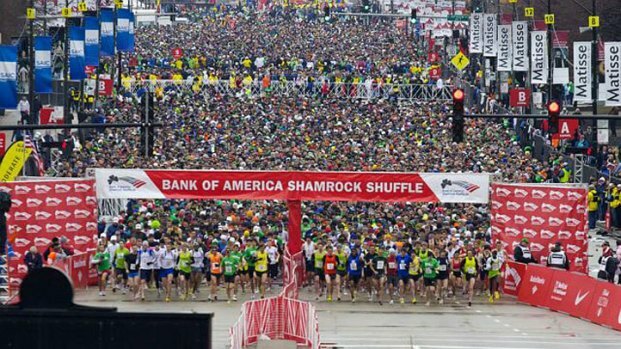 "The Bank of America Shamrock Shuffle 8K is a Chicago tradition that area runners have been looking forward to after this long winter," said Executive Race Director Carey Pinkowski. "When 40,000 people take to the streets of Chicago to celebrate running outdoors, it's energizing. I think people are ready for good weather to come and a great running season." Thousands of runners hit the streets at 8:30 a.m. Sunday, starting and finishing Grant Park in what has long been recognized as the kickoff of the outdoor running season in Chicago. "The Bank of America Shamrock Shuffle continues to be a symbol for spring here in Chicago," said Tim Maloney, Illinois president, Bank of America. "For the 35th anniversary race, I'm excited to run with participants through the city. Each year, the vast majority of runners reside in the city and suburbs, making this race a shining example of community and another opportunity for us to demonstrate Bank of America's continued commitment to the cities and neighborhoods we serve." Race director Carey Pintowski discusses plans for 2014 race and some of the charities involved.